QUITO, Ecuador – Ecuador has released 201 tortoises on Santa Fe Island in the Galapagos archipelago, where a similar subspecies went extinct more than 150 years ago. Santa Fe is the former home to Chelonoidis sp, a subspecies of giant tortoise which died out after humans took a hefty toll on the ecosystem, beginning in the 18th century when pirates and buccaneers decimated the population. “We released in Santa Fe 201 tortoises from the Chelonoidis hoodensis subspecies, which are from Espanola Island, and which have morphological and genetic similarities to the extinct subspecies on the (Santa Fe) island,” rangers from Galapagos National Park said. The 201 tortoises, which were released Saturday, were raised in captivity and are between four and ten years old. Of these, 30 have a radio transmitter that will allow park rangers to follow the animals in the wild. The park service described repopulating the island with tortoises as “a conservation milestone” and said it signified a “new methodology for ecological restoration of the archipelago,” which is located 1,000 kilometers (620 miles) off the Ecuadoran coast. The project will also study the changes that occur in the ecosystem with the tortoises and animal’s coexistence with the approximately 6,500 land iguanas that live on the island, according to Danny Rueda, director of Galapagos National Park. Experts believe 14 subspecies of tortoises have lived on the Galapagos Islands, of which three — including Chelonoidis sp — are extinct. 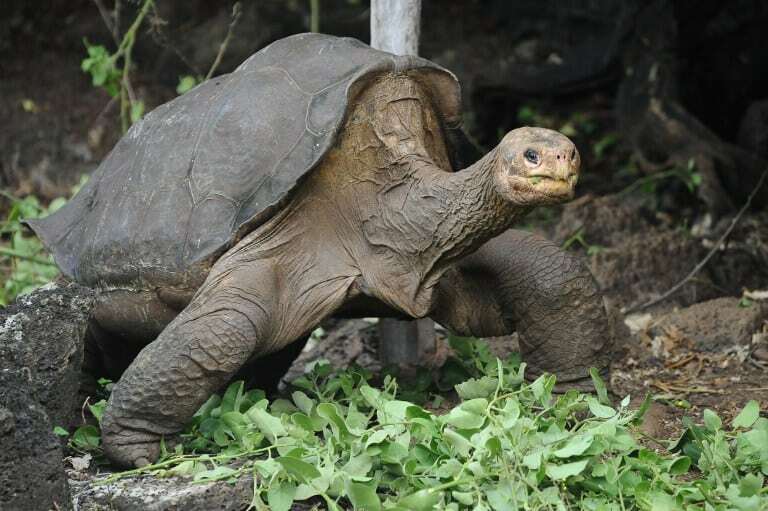 The last member of the extinct Chelonoidis abigdoni subspecies, a tortoise known as “Lonesome George,” died three years ago. The Galapagos Islands are a UNESCO World Heritage Site and are known for their unique flora and fauna. The Pacific archipelago was made famous by Charles Darwin’s studies of its breathtaking biodiversity, which was crucial in his development of the theory of evolution by natural selection. Santa Fe Island, which is located in the center of the archipelago, has an area of 24.7 square kilometers (9.5 square miles).